Finally my copy is on it's way, can't keep listening to the available previews. Is there any chance we could get the video for The Don downloadable from iTunes? I would have thought it was an ideal video for Channel 4 to show during this 3D week too. like those underpants a lot...do you get them with the cd or only vinyl? Ordered my cd today hope the underpants are included! In order to win a day at S.M.M.O.K.T making cakes and being abused by the staff,you have to send in a photograph of yourself wearing them near well any well known landmark.For instance John you would have to go to the Devils Causeway. Did make an attempt to get it on 4 s 3D week but it had to be in yellow and Blue and not in red and Green. Unfortunately, didn't get the briefs - I was looking forward to them! Gutted, didn't find any kecks. Just as well, I can't get up to the North Coast for a photo as some eejit has just written off my car. Last edited by nickking on 03 May 2010 21:11, edited 1 time in total. The Gig at Queen Elizabeth Hall this saturday 24th april , Is cancelled . but Headliner is stuck as well. 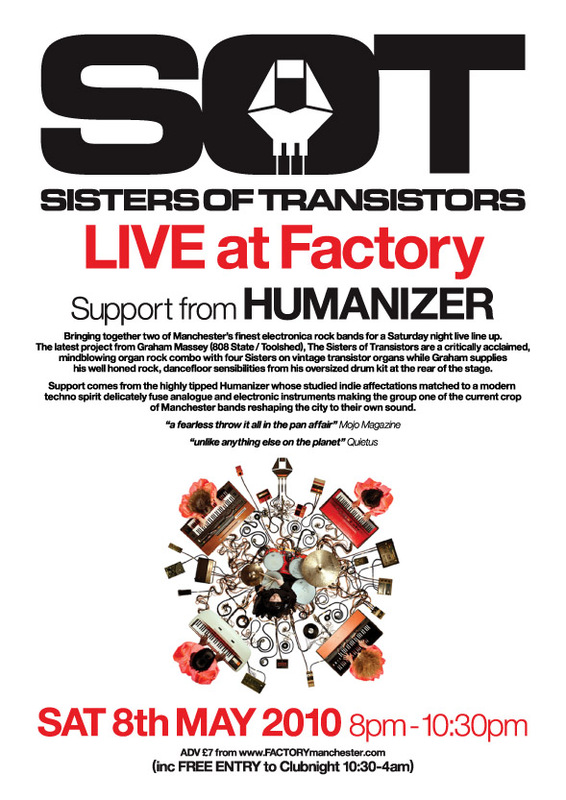 Bringing together two of Manchester’s finest electronica rock bands for a Saturday night live line up at The Factory, The Sisters Of Transistors and Humanizer provide a double bill of the best Manchester talent with each band complimenting each others considerable virtuousity and strength. The latest project from Graham Massey (808 State / Toolshed), The Sisters of Transistors are a critically acclaimed, mindblowing organ rock combo with four Sisters on vintage transistor organs while Graham supplies his well honed rock, dancefloor sensibilities from his oversized drum kit at the rear of the stage. With vocals from the entire band, sometimes in Latin or Icelandic, the wall of sound created live and on the highly rated album, “At The Ferranti Institute” powers through juggernaut disco and transcendant rock work outs which capture the recklessly diverse range of influences that come together in The Sister Of Transistors. Support on the night comes from local band and the highly tipped “Humanizer” who break off from their 19th Century Church rehearsal rooms on the Manchester Salford border to play their first gig at The Factory and for a number of months while they’ve been working on new material. A name thats generating a lot of buzz for their sonic adventures already Humanizer span a wealth of contrasting styles with studied indie affectations likened to The Stone Roses and Spiritualized match to a modern techno spirit that captures influences of Detroit and Manchester alongside the sounds of classic live dance bands like Leftfield and Orbital. Delicately fusing analogue and electronic, Humanizer are one of the current crop of Manchester bands reshaping the city to their own sound, and they are preparing an exclusive set featuring new material. THE FACTORY, 112 – 118 PRINCESS STREET, MANCHESTER. ENGLAND. M1 7EN. Starts after about 00:04:30 and mentions 808 state quite a lot. Last edited by Rich The Donkey Doctor on 08 May 2010 11:15, edited 1 time in total.